October 11th, 1943 a British spy plane encounters danger whilst trying to reach France. They crash land but "Verity" is arrested by the Gestapo. Desperate for information, they try to wheedle anything out of her. She's faced with two choices: reveal her mission or be executed. I don't think I've ever read such a great war novel like this, and very different as well. Don't let the setting and the countless strategies and airplane names fool you. 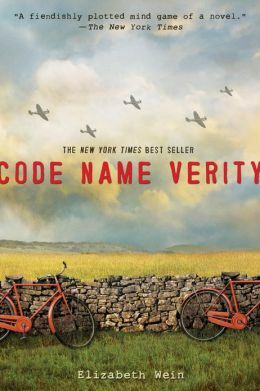 Code Name Verity is essentially a story of trust, loyalty and friendship. It's full of love and despair that at the end, I was pretty much devastated by what was happening and was not aware of how much I had grown attached to the character "Verity". In fact, "Verity" is the codename for the protagonist of the first half of the novel. She is tortured into revealing the truth of the British airforce (or something like that) and caves in. What is suppose to be a report turns into a story of her meeting and becoming friends with Maddie - codename Kitty Hawk. Maddie is a predominate character in the novel, very much the main character if not for the two narrators. She continues on from Verity's recount through the second part and Wein attempts to differentiate them according to their style of language. It's easy to tell them apart and I found that I grew attached to both characters. I really did fall in love with Verity as a character, even more so through the perspective of Maddie. They're both really badass female characters but Verity has a charm and a passion within her that resonates throughout the novel. Wein succeeded in establishing well thought out characters that had dimension and could easily sway a reader. That really added to the enjoyment of my reading. Plot wise there were some low and high points. It was actually a pretty dense read even though the book looked small. It wasn't a fast pace read, but I could understand why readers had to plod through some moments just to get to the bigger events. When you're stuck in a jail the time is slow and that reflects in Verity's writing. It makes it realistic and I didn't lose interest despite the steady pace. I felt like Maddie's part was a little windy. I had to go back to keep checking if I was reading something right or even just skimming parts because I was getting impatient. Still, the wait was worth it with what the ending brought. Wein was working towards a brilliant and very captivating ending. It really left me shocked and I had to reread that part over and over again to see if I missed anything. The novel was left open ended but in a very sweet manner, so that whilst Wein didn't push that ending, readers can still gather what is likely to occur. If you think this is solely a war based novel then think again. It definitely gives a whole new meaning to the war life, and just humanity in general. I feel like we all know the stories of the Nazi period but Code Name Verity provides an aspect no one really cared to think about. It's great that Wein produced two lively female characters who held high positions in the airforce, and she really knew what she was talking about considering she's a pilot herself. There were things to fault on but I thoroughly enjoyed reading this. I feel like it's a novel I'll constantly remember.